Filling up is easier and safer with this gas can that eliminates spills. Fuel is dispensed from the bottom of the durable container, so no more heavy lifting. An easy-to-angle flexible spout and a trigger release system give you better control over filling and pouring (and an added measure of safety). 5 Gallons: 15.82" x 11.62" x 17.31"
Weight: 2.2 Gallons: 3.4 lbs. ; 5 Gallons: 4.56 lbs. Safer than regular gas cans. Works just like it should. It works great and I like it easy to use and is easy to regulate the flow too. I now own three SureCans they are excellent. This is a phenominal product. I now own three surecans for various equipment. Maker Brad Ouderkirk was fed up with spilling fuel on himself, his equipment, and his lawn (it happens to the best of us). 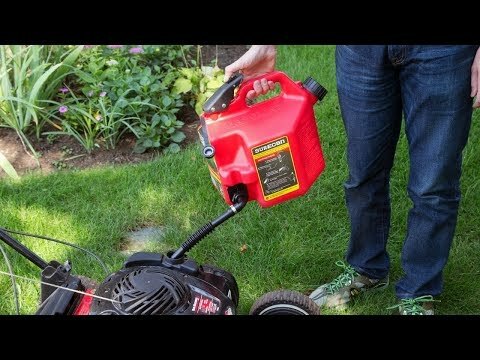 So he created a Made in the USA gas can that eliminates spills as a better way to fill up. 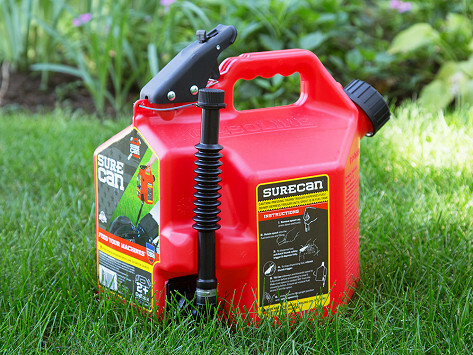 SureCan dispenses fuel from the bottom, which makes it safer and more convenient to store and pour fuel. The durable container is not only easier to use, it also prevents any heavy lifting—and the flexible spout means no more awkward angles trying to fill a tank. Brad didn’t stop at changing the dispensing location, he included a trigger release system to give you more control and an added measure of safety. Plus, he made the fill cap and spout child-proof, and the inner layer helps remove the smell of fuel. His redesign smartens up the filling up.